Broken Arrow’s FREE T-Shirt design tool is one of easiest, most advanced online T-shirt designers available! Using the T-shirt design tool is super easy. But if it’s your first time and you aren’t feeling overly confident no worries! This blog can help. And by the way, you can use the t-shirt design tool to custom decorate a lot more apparel than just T-shirts! Click on the link above, then find the garment you want to decorate by scrolling down through the headings listed and clicking on the item you like. If you don’t see what you are looking for by scrolling, click on the PRODUCTS heading and find the category you are looking for. For this example, go to Brands and Choose American Apparel by clicking on the words “American Apparel.” Choose the American Apparel California Fleece Pullover Hoody by scrolling to the item and clicking on the “design now” button located just below the hoody image. Just for fun, let’s change the product color. Click on the down arrow next to the color swatch and scroll to “heather gray”. Click on heather gray and the sweatshirt image should change to gray. You can size the image by clicking on the blue dots that mark the image corners. Shrink the image a bit then add the word “Colorado” below it by clicking on “add text.” The words “NEW TEXT” will show up on your design. 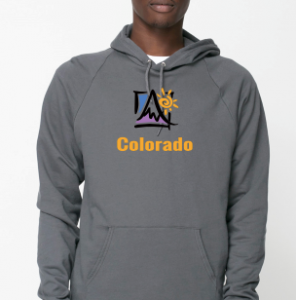 Change “NEW TEXT” to Colorado by clicking on the text box that appears to the right of the sweatshirt image and typing in the state name. Change the color of the word “Colorado” to sunny yellow by clicking on the black swatch to the right of the text box. Available color swatches will appear. Choose the same sunny yellow shown in the “colors in use” bar. Move the word to below the image by clicking on the text box and dragging it to the proper location. Congratulations! You’ve created a custom sweatshirt design using the T-shirt design tool. Save your design by adding it to the cart. A new screen will pop up. Type in a name for your design. Call it “Colorado Mountain.” In the next box, add a message that says, “Learning to use the designer,” then hit continue. A new page will appear asking for you to choose sizes. If you don’t know the sizes yet, or just want to save the design, scroll down to the ‘Save Design” box and click it. Type in your e-mail address and presto! Your Colorado Mountain design is saved! It’s as easy as 1, 2, 3! Now that you’ve got the hang of it, try your own design! From the product catalog you can choose from hundreds of T-shirts, polos, sweatshirts, caps and so much more! You’ll find all sorts of apparel in a variety of fabrics, styles, sizes, colors, and price points. With features like “distress effects” you can make newly created designs appear as a vintage classics. Choose the product you want and the art that suits your business, sport, or event, and let your creativity juices flow! You can choose a different location for your design or even add multiple design locations. There are also multiple fonts to choose from for any words you’d like to add? Need to add a specific logo? You can upload your own art or ask one of artists to create and upload the logo for you. Art services at Broken Arrow are also free. Choose from hundreds of products with no minimum order quantities, so whether you want 1 or 2 or a 102, you can order as many or as few as you need. You can also take advantage of quantity discounts. No worries. Our staff of experts can help you create the design you need. Text or call us at 800-810-4692!